Safe to assume the ‘defenseman of the week’ honor wasn’t a difficult decision for the USHL brass this week. White Lake native Ronnie Attard received the aforementioned award today after a seven-point weekend for his Tri-City Storm. 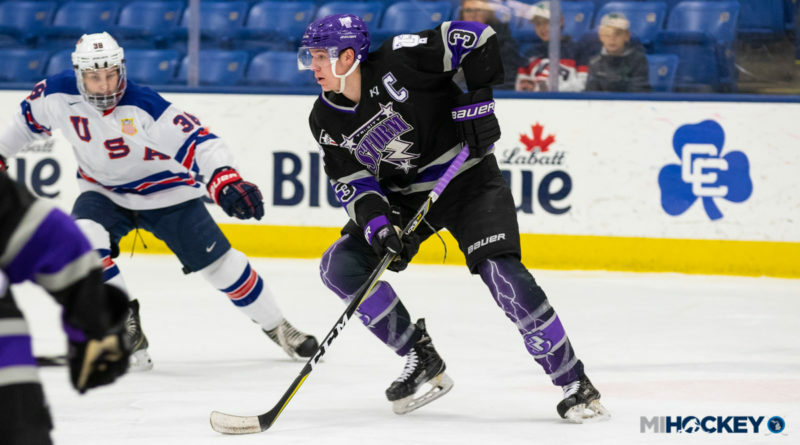 The Western Michigan commit scored four goals from the blue line on Friday, leading the Storm to a 7-0 shutout win over the Green Bay Gamblers. That was the first four-goal game by a USHL blueliner since Quinn Hughes accomplished the feat on Dec. 30, 2015. He wasn’t done, either – the next day, he recorded one goal and two assists to finalize a sweep of the Gamblers. Attard, a Honeybaked and Victory Honda alum, has 37 points on the season. His 18 goals are one shy of the USHL Tier 1 record. It’s the third time this season he was named USHL defenseman of the week; Attard received the same honor on Dec. 3 and Jan. 14. He also wore the ‘C’ for Team USA at the 2018 World Junior A Challenge this season, helping Team USA capture gold. Attard was ranked No. 143 on NHL Central Scouting’s midterm rankings for the upcoming 2019 NHL Draft.